Beautiful highly detailed sheet with a hummingbird printed in colour from plate and finished by hand. 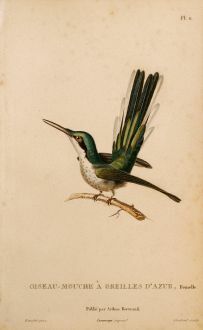 "Histoire naturelle des oiseaux-mouches" was the first work of three by Lesson on hummingbirds. This was the most comprehensive work on hummingbirds until Gould's great monograph started around 20 years later. René Primevère Lesson: Oiseau-Mouche à Oreilles d'Azur, Femelle.